I took my son to see The Odd Life of Timothy Green yesterday. It’s not the movie we planned on seeing – we were going to see Paranorman, but there was a bad thunderstorm, we hadn’t had lunch, and our plans were fraying at the ends, so we walked into the AMC Dine-In Theater at Pleasure Island, just before noon, and The Odd Life of Timothy Green was starting at 12. We were both surprised with how much we liked the film – we ended up liking it much more than we thought we would. For those of you who aren’t in the know, the movie is about a couple unable to have kids who are suddenly surprised with the magical appearance of a 10 year old boy from their garden. It feels like a modern retelling of a classic fairy tale, but not one you’ve seen before. But there are pieces of the film that are familiar, that maybe you’ve seen before in films like The Martian Child. There are heavy themes in the movie as it deals with topics of infertility, adoption, parenting, love, death, bullies, the economy, and much more. It seems very rich in subtext as you think about it, but it’s all tied together with this one boy. The imagery and symbolism, while sometimes heavy-handed, helps tie all these themes together. Even with all the deep themes underlying the story, the film remains whimsical, and appropriate for kids. My son is 10 and he liked it a lot. At the beginning, he said “this is a sad movie” and he’s right. The beginning is sad, but not as sad as Pixar’s Up. And I would say the film is much more uplifting. Ultimately, the film is about emotion, and that’s really what makes it shine – the film feels familiar not just because of familiar plot elements or characters, but because we’ve felt these emotions that are shared in the film and that we all share with each other, just as the characters share them. And at the end, the emotions linger, reinforced by every leaf you find on the ground after. 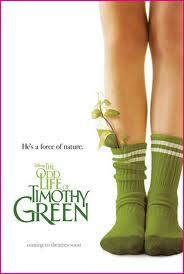 This entry was posted in movie review and tagged movie review, the odd life of timothy green. Bookmark the permalink.